Storage benches are known to be helpful in entryways and mudrooms. But they can also be useful in bedrooms, laundry rooms and hallways. By providing both seating and storage, they simultaneously solve two dilemmas: where to sit and where to store stuff. Many storage benches have flip-up seats, which means you can’t access the storage section while seated. That’s why I recommend storage benches that offer access from the front, so you can sit down while putting away items and accessing other items at the same time–for example, removing your outdoor shoes and putting on house slippers. Depending on what you want to store–shoes? backpacks? purses? hoodies? pet paraphernalia?–you’ll need different storage options: cubbies, drawers, baskets, shelves, coat hooks or a combination of these features. Drawers plus cubbies. The Mudroom Storage Bench features three small drawers (ideal for storing mittens, leashes and other small necessities), 10 shoe cubbies, and a removable seat cushion that attaches to the bench with loop and hook straps. At only 12.75 inches deep, it can fit in a hallway or other narrow space. Open shelf plus coat hooks. The Hallway Bench with Coat Rack has a comfortable padded seat atop an open storage shelf that’s spacious enough to accommodate backpacks, purses, shoes and more. Four double coat hooks provide an easy way to hang up jackets, hats and other outerwear. Shelf plus baskets (or a second shelf). The Hall Bench with Storage Baskets offers an open shelf above a compartment that contains three woven baskets (each 11 x 9 x 10 inches) sized for holding all types of accessories. Since the baskets are removable, you can take them out to use elsewhere and utilize the open space for storing larger items. Read more ideas for entryway and mudroom organizers here. Entryway closets, aka coat closets, hall closets or front closets, are famous for being cluttered. (Cue Fibber McGee & Molly.) Traditionally they’ve tended to function as a sort of dumping ground for whatever doesn’t fit elsewhere–vacuum cleaners, luggage, pet supplies, sporting gear, etc. All of that, of course, is in addition to storing outerwear such as coats, hats, shoes and umbrellas. Adjustable. 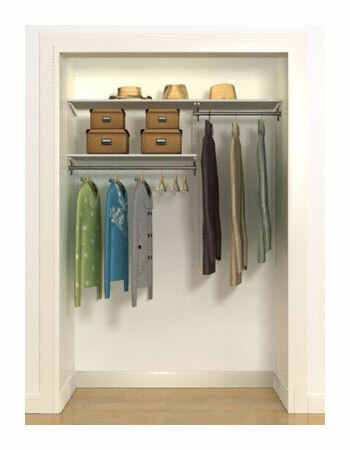 Freedomrail’s Long Hang Starter Closet is ideal for organizing all types of closets but is especially good for coat closets. With sections for both long and short hanging garments and shelves for hats and other accessories, it’s easily adjustable so you can stray from the original design and create a closet system exactly suited for your space. Bins. Stackable bins are useful in entryway closets for corraling everything from caps to dog toys. Plastic Storage Bins are an economical and effective example. Cubes. Cube storage modules make it easy to create customized storage solutions inside or outside a closet. Cubes with shelves are particularly handy for keeping shoes in order. 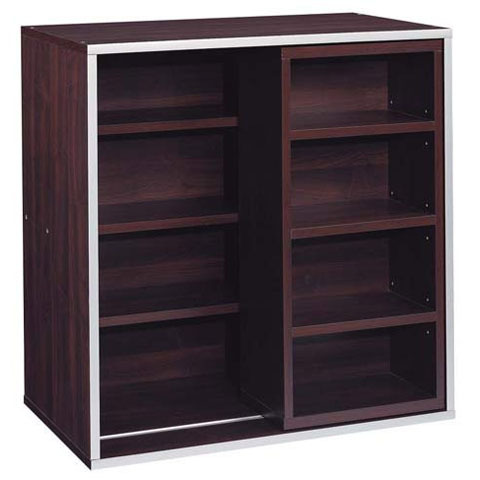 The Quad Cube with Sliding Shelf features a sliding front shelf that moves from side to side to reveal (or hide) additional storage space in back. If you don’t have an entryway closet, you can easily create an alternative with the rolling Pipe Style Wardrobe Rack–its thoughtful design includes a rod for hanging clothes plus shelves for holding purses, hats and shoes. A similar option is the Rolling Honey Can Do Wardrobe Rack. For more entryway organizing ideas, read my other posts on this topic.